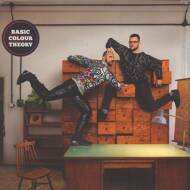 The Polish DJs, producers and Pets Recordings' label owners known for their electrifying performances and catchy cuts announce their third LP, 'Basic Colour Theory', a fruitful collection of evocative melodies and gorgeous vocals. This album marks a pivotal moment in their career as house outfit Catz 'N Dogz. Taking firm lead of the Eastern European electronic music revolution, the pair, who have previously graced the cover of both Mixmag and DJ Mag Spain, have for some time been poised for significant success as their international recognition on the underground has never lacked momentum. 'Basic Colour Theory' will add to the list of remarkable accolades the dynamic duo already have under their belt; joining their acclaimed Essential Mix in 2013, and weighty remixes for a who's who in music electronic or otherwise, including Basement Jaxx, Kings Of Leon, Thomas Schumacher, Friendly Fires, and Kim Ann Foxman, not to mention their two previous LPs. Colour; such a pervasive part of everything we visually encounter, and its many theories a logical structure that for many artists, designers and music producers becomes an intuitive choice - a melting pot of ideas and influences in varying quantities. Evoking particular moods and emotions through choice of palette in design and sound architecture.